If we listen to medical doctors and government health workers, vaccination has helped eliminate all kinds of diseases and is absolutely necessary for our health. Dr. Paul Offit, an 'internationally recognized expert' in immunology and virology explains that a young infant is fully capable of generating protective humoral and cellular immune responses to multiple vaccines simultaneously. He uses some physiological immune facts to support the outrageous conclusion that an infant would have the theoretical capacity to respond to about 10,000 vaccines at any one time - a conservative estimate he says! Offit is a consultant to Merck pharmaceuticals and co-developer of its new rotavirus vaccine RotaTeq, with a share in the patent and, presumably, the expected profits. The problem is, if vaccination has eliminated all these diseases, why are there ever more shots to be administered, and why are our kids getting sicker from year to year? Evelyn Pringle, investigative writer on health matters, has pulled together in a comprehensive review what we know about the widespread health damage caused by vaccines. The article should make your skin crawl - if you are a parent with small children - or bring your rage to the boiling point if you have been wondering why making pharmaceuticals has become the most profitable industry of all. Take your health and that of your children into your own hands! As long as we run to the doctor with each slightest sniffle to get an antibiotic and as long as we obediently get the "necessary" shots each year, we have really nothing to complain about. We know the experts, like the good Dr. Offit, have financial interests in the "prevention" they sell so why do we continue to give them our attention? “Why are our special education classrooms so crowded that we can’t find enough money or train teachers fast enough to care for these learning disabled, hyperactive, autistic, asthmatic, diabetic, emotionally disturbed, sick children?” Fisher asked. “Mr. Speaker, something dreadful is happening to our youngest generation, and we must sound the alarm and figure out what is going on with our children,” he said. He quoted the Department of Health and Human Services when explaining that one in every 167 children was being diagnosed with an autism spectrum disorder. “Furthermore," Weldon reported, "one in 7 children is being diagnosed with either a learning disability or a behavioral disability." “ICDRC estimates the minimal cost in present value, to care for those 420,000 existing children with autism is $1,260,000,000,000 (based on $3million/lifetime and 420,000 children affected)." It is a sad tale when the government forces parents to conduct an experiment on their children with neurotoxins because of their own incompetence, subsequently denies the results (neurotoxicity/autoimmune disease) of that experiment and then prevents parents from seeking restitution or financial help to assist the children they forced to be poisoned. Some parents are being forced into bankruptcy to help their poisoned children. I am related to an autistic child. During my research to help my daughter, I happened upon a series of articles by Dan Olmsted of United Press International and was struck by one of his most recent pieces "A Big Secret". This article, which can be accessed from the url below shows that of a rather large population of children in excess of 100,000 none of whome were vaccinated - Not a single child was autistic, had asthma or diabetes!!!! This was absolutely astounding, given that each of these conditions is an epidemic in our nation's children. In any event, my further research into this issue eventually took me to the government's mandatory vaccine program, which all children must abide by in order to attend school. As I began to understand the possible damage to our nation's children which was apparently done by the mandatory vaccine policy, I was quite disturbed. Numerous parents contend that the mandated vaccine program forced them to damage their children. The following websites are a small portion of the articles I reviewed in my research. They provide a current understanding of autism/autoimmune disease, which is epidemic in our children and the history and related issues of this apparent tremendous self-induced tragedy. This is an extremely important issue. Please review all of the articles listed below. You may find this information compelling. The articles will give you a fine historical understanding of this issue and how it has been handled since close to the autism epidemic inception. But there is a crisis of autoimmune diseases in our children and this should also be ackowledged. After you go through the first article, please review the other pieces. They are important in understanding this critical issue and how it has been handled and is presently being handled by Congress and related government agencies. Note that these articles are not anti-vaccine and should not be construed as such. This is an attempt to have people understand the mandatory vaccine program, the role of related agencies and our government officials so that more transparency will occur about what they force on our citizens. I think this information is crucial. Please review it all. Thanks. No autism, asthma or diabetes in unvaccinated!!!!!!! WHAT'S HILLARY DOING FOR THESE CHILDREN IN HER NY VILLAGE? No Shots, No School ... No Kids. Much more than just autism!!!! Autoimmune Epidemic!!! Why would the government target to cut out an infinitesimal part ($50 million) of a $2.6 trillion budget - to study autoimmunity/disease in children? Tragicallly, the mainstream media doesn't deal with this issue forthrightly - Why? Shows declining neurological developmental impairment with elimination of thimerosal containing vaccines!!!!!! What Is in a Flu Shot? 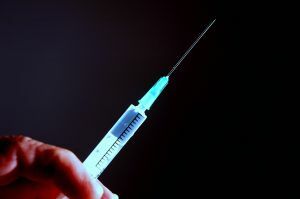 some flu shots more toxic than hazardous waste! If two dozen once-jittery mice at UBC are telling the truth postmortem, the world's governments may soon be facing one hell of a lawsuit. New, so-far-unpublished research led by Vancouver neuroscientist Chris Shaw shows a link between the aluminum hydroxide used in vaccines, and symptoms associated with Parkinson's, amyotrophic lateral sclerosis (ALS, or Lou Gehrig's disease), and Alzheimer's. Shaw is most surprised that the research for his paper hadn't been done before. For 80 years, doctors have injected patients with aluminum hydroxide, he said, an adjuvant that stimulates immune response. Many vaccines may have more dangers than you might know. The major media articles below raise serious questions about dangers which have not been adequately addressed by the producers of many vaccines. I just finished reading David Kirby's thoughtful, well-written and compelling book, Evidence of Harm. Anyone who hasn't gotten their hands on this book should order the updated paperback version as soon as it is published, sometime this month. Unless you have been on Mars for the past few years, you are aware of a huge controversy surrounding the use of thimerosal in vaccines and the possibility that it has been a cause of autism. In his book, Kirby provides a detailed and riveting account of the controversy. Mercury is a known neurotoxin, often said to be the second most toxic substance on the planet. A former Government medical officer responsible for deciding whether medicines are safe has accused the Government of "utterly inexplicable complacency" over the MMR triple vaccine for children. Dr Peter Fletcher, who was Chief Scientific Officer at the Department of Health, said if it is proven that the jab causes autism, "the refusal by governments to evaluate the risks properly will make this one of the greatest scandals in medical history". Please take a printout of this article and read it in its entirety. If after reading this article, by a noted legal expert on vaccine induced diseases and an MD, you still feel that it may be wrong then please TAKE A PRINTOUT OF THE ARTICLE AND DISCUSS IT WITH YOUR DOCTOR. (Watch his body language carefully even as he vociferously denies the facts presented in the article). Actually not I but your doctor should be giving you all this information. We have the right to know the pros and cons of this medical procedure which is not mandatory in our country but the doctors make it so. It is very difficult, almost impossible, to say no to the many vaccines our doctors routinely force on our children. Eight years before the U.S. government decided to remove mercury from most childhood vaccines, federal health officials were already receiving reports linking vaccinations to new cases of autism. Starting in 1991 after the government set up a database to record adverse reactions to vaccines, doctors, parents and others reported frightening responses to inoculations in children subsequently diagnosed with autism. Vaccinated children exhibited severe brain damage, high-pitched "hyena" laughs and screams, drunken behavior, senseless babbling, infantile spasms and seizures, "bug-eyed" looks, and the complete loss of abilities like toilet training and language, according to the Vaccine Adverse Events Reporting System (VAERS). There were 83 such reports from across the country before the government asked vaccine manufacturers in 1999 to remove thimerosal -- a preservative containing mercury. Correspondence newly obtained under the Freedom of Information Act raises troubling new questions about CDC's role in the Thimerosal scandal. Thimerosal is the mercury-based vaccine preservative that has been linked to epidemics of neurological disorders, including autism, in American children born after 1989. A retired vaccine researcher goes public on what the pharmaceutical industry and the health authorities don't want us to know: that vaccines are unsafe, untested and one of the greatest frauds of our time. Babies given the new five-in-one jab face a risk of convulsions, brain damage or even death. Results of medical trials by the firm which makes the vaccine have revealed that the "superdose" vaccination, which was introduced 18 months ago, can have serious side-effects. The five-in-one is designed to protect children against diphtheria, tetanus, whooping cough, Hib influenza and polio in a single shot. Evidence from the vaccine's manufacturers, Sanofi Pasteur, shows that in clinical trials 64 per cent of 451 babies given the Pediacel jab experienced bad reactions. Ten per cent of these were "moderate to severe". These included convulsions, loss of consciousness and high-pitched or persistent inconsolable crying. Other studies showed that components of the vaccine can cause breathing difficulties, blue discolouration of the skin due to lack of oxygen, swelling of the brain, low blood pressure and extreme allergic shock. THE SAFETY of the MMR innoculation, the combination vaccine given to young children and widely supported by scientists, will be questioned again this week in a presentation that claims to provide proof of a link to autism. American researchers say that their study supports the findings of Andrew Wakefield, the discredited gastroenterologist who raised fears that the measles, mumps and rubella injection might be causing autism. The Age of Autism: But is Wakefield right? WASHINGTON, DC, United States (UPI) -- Dr. Andrew Wakefield, the British gastroenterologist who first raised the prospect of a link between the measles-mumps-rubella vaccine and autism, is being pursued by British medical authorities. According to the BBC: 'The Independent newspaper reports that the General Medical Council will accuse Mr. Andrew Wakefield of carrying out `inadequately founded` research. Vaccination rates fell sharply after Dr Wakefield questioned the safety of MMR, raising fears of a measles epidemic. Ahhhhhhhhh....you see its the Almighty Dollar that dictates health policies even if that means putting the mercury ion into infant brains. Then the free radicals generated by this ion cause oxidative injury in nerves and in neruronal cells resulting in new conditions in a significantly large number of people that will require more pharmaceutically prescribed drugs. So, with the support of politicians and lobbyists, the vicious cycle of toxicity and more drugs will eventually ensure an intake of about one kilogram of drugs per American body per annum (up from about 200 grams) producing a super rich pharmaceutical industry and a chronically sick society dependent on prescription drugs. The perception is that America's official concept of health revolves, not on micronutrients and antioxidants from natural sources but around pharmaceutically prescribed drugs and vaccines. Good luck to all of you because of you need a large dose of it, as any amount of screaming on the internet is unlikely to change the scenario. Jagannath Chatterjee from India posed the question whether Dr Wakefield was right to link the MMR vaccine with autism. Here is the response of Dr. Paul King, as posted by Jagannath to the Alternative Medicine Forum Yahoo group. If you look at the harm to the immune system precipitated by Thimerosal-preserved vaccines (that has been clearly elucidated in some recent papers) given before, or at the same time as the MMR and/or chickenpox vaccines, it seems obvious that natal and post-natal exposures to Thimerosal at levels down to below 0.03 ppm and/or to INORGANIC mercury at similar levels are known factors in poisoning their developing immune systems. The recent reported cases where fetal abortion occurs shortly after the mother received a Thimerosal-preserved "flu" shot clearly shows that the dangers of vaccinating a pregnant woman with a vaccine containing an unnecessary human TERATOGEN that the "healthcare estab-lishment" clearly knows and the papers that have clearly established that the current human "flu" vaccines are NOT effective in preventing the spread of the flu, clearly show that the worldwide "healthcare establishment" seems to be engaged in practices that fatten their financial interests by knowingly harming the most vulnerable, the unborn and our children. As Dr. Wakefield hypothesized, IN SUSCEPTIBLE CHLIDREN, the live measles virus in the MMR shot is "mishandled" by the immune system and causes death or, for those who survive death, seizures, encephalopathies, and other central nervous system and gut damage, which may lead to a diagnosis of "regressive autism" with "gut dysfunction." Hopefully, you may see that, except for a small percentage of the "autism" diagnoses that are clearly genetic (in the sense that these cases have identifiable gene abnormalities (usually on chromosome 2, or Fragile X or Rhett's), MOST (more than 75%) seem to have underlying mercury poisoning that, coupled with the cases' diet, disease and medicinal exposures, leads to a diagnosis of "regressive autism" or other "autism spectrum disorder," which, once identified, can, to some extent, be mitigated by appropriate corrective interventions (dietary, supplemental and medicinal). d) diets severely deficient in the biological precursor biochemical compounds (e.g., cysteine, the B vitamins, and vitamin C) needed to produce the biochemicals used by the human body to intercept, bind, and detoxify the body from the dietary and environmental mercury to which they are/were being exposed. alpha-lipoic acid, algal products, N-acetylcysteine) have been reported to be mitigatory and curative. Realistically, medicine needs to learn to work with nature in all areas rather than to continually ignore nature. Were the preceding practices to be followed, then, except for the vaccine makers and those paid to promote or deliver vaccinations, the emerging problems with the current "universal vaccine programs" would be stopped. Hopefully, you can help your nation awaken to the preceding realities as the US has been so propagandized that most of the preceding truths have been co-opted by greed-driven "modern" medical practices that are at odds with nature. As you know, historically clean air, clean water, enough food and basic sanitation have done more to limit the incidence of all diseases than any vaccine that has been developed, including the vaccine for smallpox, whose propensity to cause harm was realized in the United States when the use of a "new, improved" smallpox vaccine was supposed to be given to 500,000 first responders, but "was stopped" after vaccination of 38,000+ had KILLED 3 and seriously harmed the health of hundreds of others -- producing death and harm at 100-times the vaccine maker's and the government's touted/"predicted" rates for "adverse events." have been eradicated but, because "research stocks" were preserved and disseminated, have allowed "rogue" nations to develop "weaponized" mutated-smallpox virus delivery systems (so-called "bioweapons") with which to threaten the world! this information will be helpful to you in your efforts in India and elsewhere. These comments are being provided ONLY for information and NOT as medical advice or to recommend any particular course of action to any person.